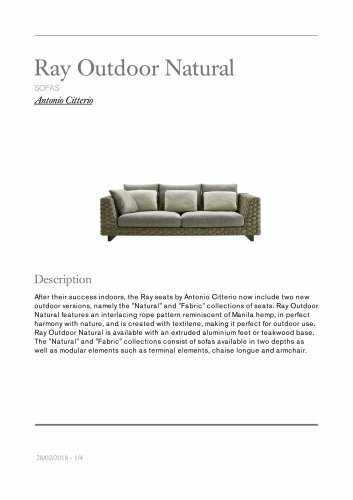 Description After their success indoors, the Ray seats by Antonio Citterio now include two new outdoor versions, namely the "Natural" and "Fabric" collections of seats. Ray Outdoor Natural features an interlacing rope pattern reminiscent of Manila hemp, in perfect harmony with nature, and is created with textilene, making it perfect for outdoor use. Ray Outdoor Natural is available with an extruded aluminium feet or teakwood base. The "Natural" and "Fabric" collections consist of sofas available in two depths as well as modular elements such as terminal elements, chaise longue and armchair. RN236DB RN236LDJB B&B Italia reserves the right to make technological and aesthetic improvements to its models, including changes to the sizes and materials, without notice. The technical drawings do not define the details of the product. The measurements shown are indicative and may undergo changes. In particular, the dimensions relevant to the padded parts are subject to usage tolerances over time caused by the normal adjustment of the padding. For the specific information, please contact the dealer closest to you.